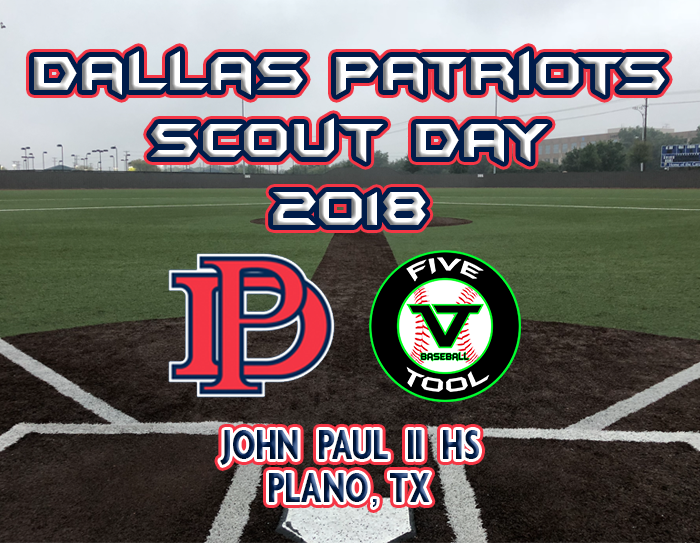 On Sunday, Dallas Patriots held their Scout Day at John Paul II HS in Plano, TX which featured uncommitted prospects from the 2019-2021 classes. The event consisted of a pro-style workout with a scrimmage at the conclusion of batting practice. Five Tool was on scene to capture video for social media as well as the measurements from the players. To see the final results, please click here on this link. The Patriots rolled out a few left-handed arms that are sure to continue to improve leading up into the spring high school season. One in particular came from the 2020 class, Daniel York out of Rockwall Heath (TX). His fastball sat 83-85 MPH, but it definitely jumped on hitters. At 6-3, 155 lbs., York is going to be a player who will have a chance to make some jumps and be a nightmare for left-handed batters. In the 2019 class, right-handed pitcher Joseph Steeber was dominate in his inning of work. Steeber was able to use his 72-74 MPH curveball to get ahead in the count to start and then powered his fastball (86-88 MPH) by hitters with arm side run. His two-seam fastball was clocked at 84 MPH and had good movement away from left-handed batters. Steeber is 6-3, 210 lbs. from Southlake Carroll (TX). In the 2019 class, Jaeden Rodriguez showed off plenty of speed with his 6.7s 60-yard time and then hit a triple in the scrimmage. Rodriguez looked very comfortable at the plate and could be a leadoff guy at the next level. He’s a 6-2, 165 outfielder from Woodrow Wilson (TX). In the 2020 class, Sam Crowell posted a 94.8 exit velocity and had a 1.97 catcher’s POP time. Crowell hit the ball hard all day and showed plenty of promise as a dude to watch. He’s 6-1, 197 lbs. out of Rockwall Heath (TX). There was also Travis Gober from the 2020 class who posted a Patriots best 96.9 exit velo. The corner infielder was lower 80s from first to third and also on the mound as an RHP. Gober has a polished swing from the left side and backed things up in the scrimmage by cranking a double to the left-center gap — check him out in the video below flashing some speed on the hit. Gober is 6-3, 215 lbs. out of Rockwall (TX). Tanner Dieleman, Krum (TX) 2020, was a prospect who continues to improve throughout Five Tool events. The 6-0, 190-pound 3B/RHP topped out at 86 MPH on the mound and in the infield throwing from short to first base. Dieleman is also constant as a switch hitter. From the left side, Dieleman posted an 89.2 MPH exit velo. And from the right side, he posted an 89.9 MPH exit velo. Check him out pitching in the video below. One more prospect who stood out from the 2020 class was Aidan Gebhart. At 5-11, 175 lbs. out of Frisco Heritage (TX), the catcher posted a top exit velo of 95.8 MPH. Gebhart is a player who uses max effort and definitely has some quickness to his game. Behind the plate, Gebhart posted a 1.97s POP time. And going into the 2021 class, Bryson Adair showed off a very strong arm all around on Sunday. From the outfield, he was 89 MPH. From the infield, he was 86 MPH. And on the mound, he was 85 MPH. Adair is a 6-1, 165 lbs. prospect out of Elhart (TX). Kevin Bazzell was another prospect who was very “toolsy”. Bazzell was 87 MPH from the infield and behind the plate posted a 1.88s POP time. Bazzell showed his POP time was no joke as he hosed a runner in the scrimmage. And at the plate, Bazzell had a 90.7 MPH exit velo. Bazzell is 5-11, 170 lbs. out of Rockwall Heath (TX). Catcher Cayden Phillips is one last prospect from this talented 2021 class to take note of as a standout performer. At 6-2, 180 lbs., the Amarillo (TX) prospect had a top 1.84s POP time. He also posted an exit velo of 90.3 MPH. In the scrimmage, Phillips commanded the game and was an easy target to throw too. He’s going to be a dude as he continues to grow. To check out all the highlights from the Dallas Patriots Scout Day, be sure to check us out on Twitter at @VToolShow and @VToolTexas. You can also catch us on Instagram @vtoolshow and on Facebook @vtoolshow.